Happy Easter everyone! 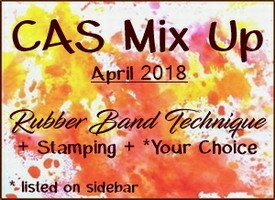 It's April 1st and I'm also hosting this month's CAS Mix Up Challenge!! And my challenge is to use a Rubber Band Technique! What? You've never heard of using rubber bands to ink a design? Or maybe you have but haven't done it in a long time?? 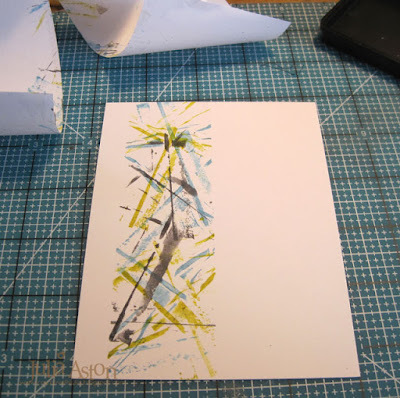 And here are a few photos of how I used a rubber band technique on the colored strip on my card. First I masked off a column on a panel of white card stock using some Eclipse Masking paper. It helps to work on a grid so you are sure your papers are straight. 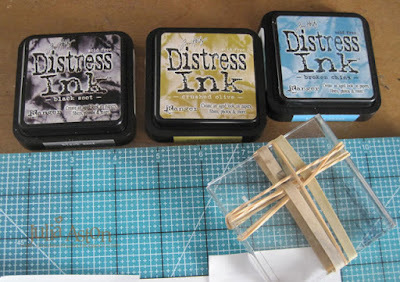 I chose 3 colors of Ranger Distress Inks to use, Black Soot, Crushed Olive and Broken China. 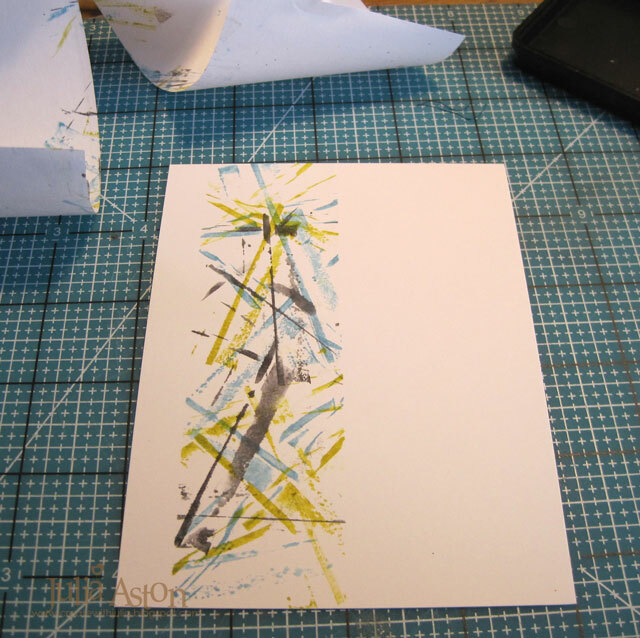 And I wrapped some thin and thick elastics around an acrylic block. 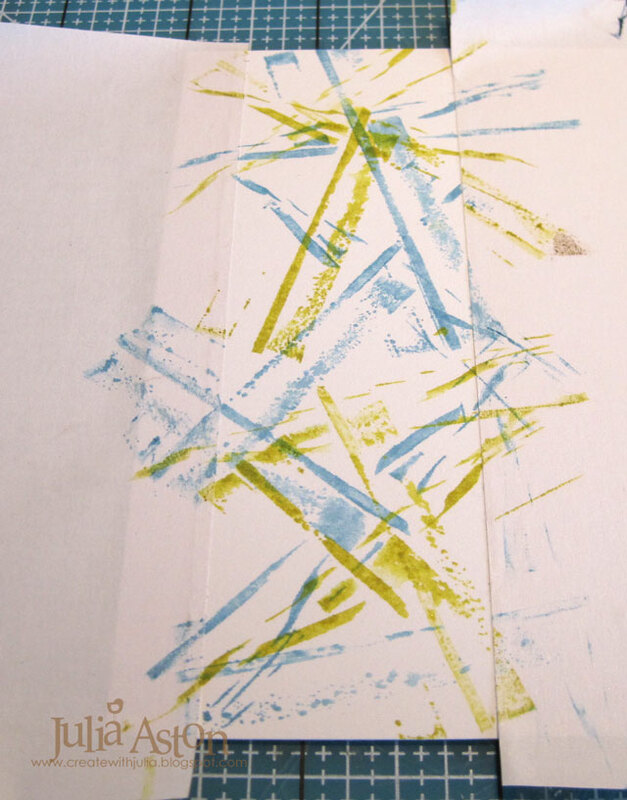 First I pressed the Broken China Distress ink over the elastics. 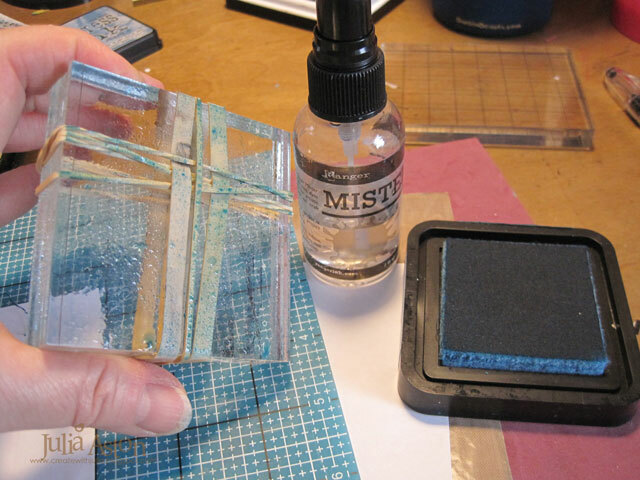 Then I spritzed the block lightly with water and pressed it against the masked panel. 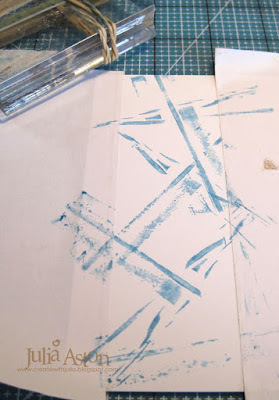 I inked up the elastics 3 times with the blue, spritzing with water each time I 'stamped' them over the panel - moving the block around so the pattern was varied. You don't really know what it will look like until you're done! and inked it up with Crushed Olive and 'stamped' three times. Then I did the same with Black Soot - stamping the dark color less times so it didn't over power the other colors. 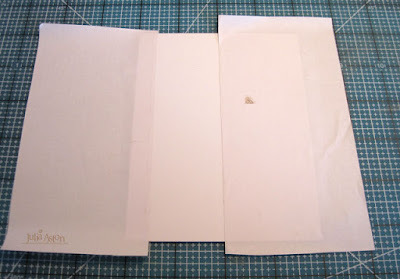 Then I removed the masking paper and revealed my lovely rubber band technique design! The sentiment says "Happiness held is the seed. Happiness shared is the flower". I knotted a piece of bakers twine around the panel. I layered the panel onto a slightly larger Limeaide Ice panel and then to a slightly larger Hawaiian Shores Panel and all of it to a white card base. I brushed over the flowers and the Crushed Olive inked parts with a Clear Glitter Wink of Stella - you can see the shimmer on this photo I hope! You can't see the glittery shimmer at all on the photo below - but it IS really shiny IRL when you tilt it in the light! So please join us and show us how you use the Rubber Band Technique!! 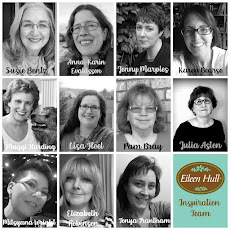 The CAS Mix Up Design team has lots of creative inspiration over on the challenge blog here. And there are links to videos using the technique too! 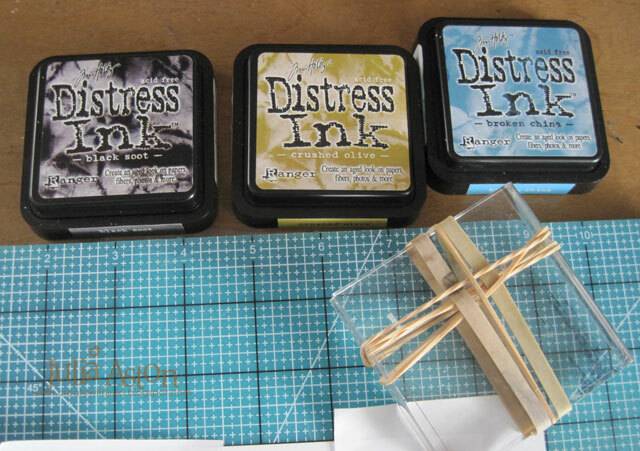 Ink: Ranger Distress Crushed Olive, Broken China and Black Soot, True Black - PTI, Hero Arts Black. Accessories: Caribbean Bakers Twine - The Twinery, Clear Glitter Wink of Stella Brush, clear acrylic stamping block, assorted width elastic bands, water mister. I've heard of the technique, but have never seen it used so effectively as you have in this card! Excellent work!!!! 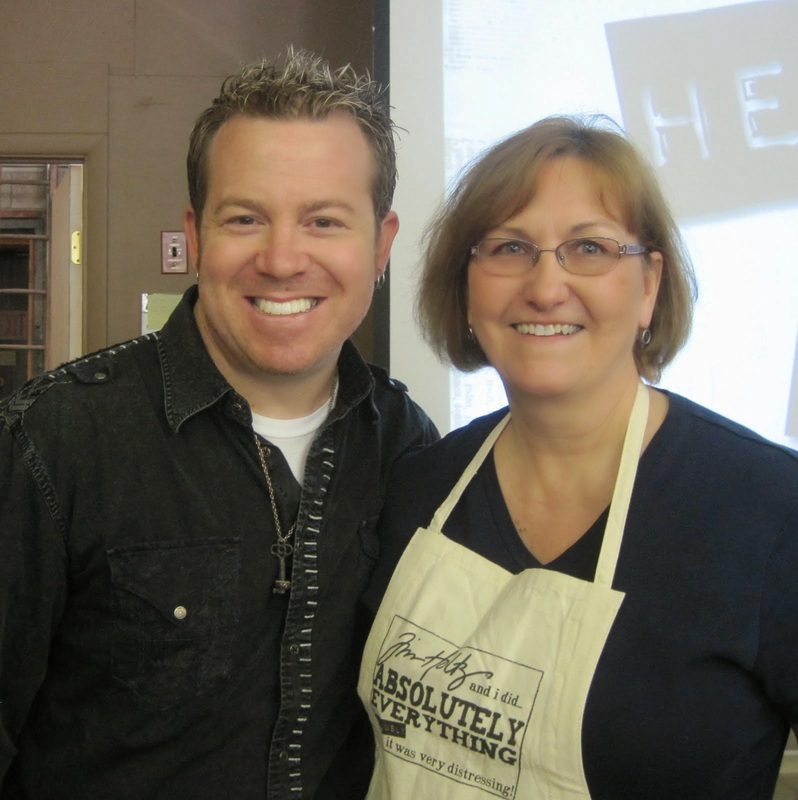 Thank you so much Julia for hosting this fun challenge. 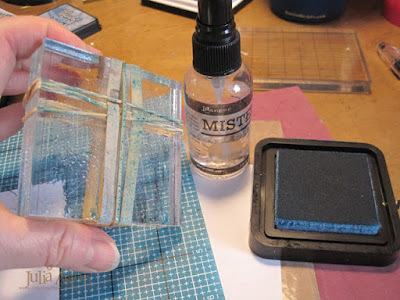 I love how you used an acrylic block to ink, spritz with water and then stamp your rubber bands. 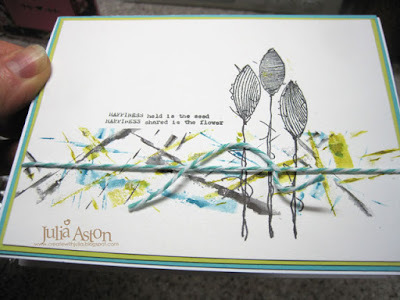 Beautiful with the added twine and stamping. Beautiful sentiment too. TFS my friend. Hugs. 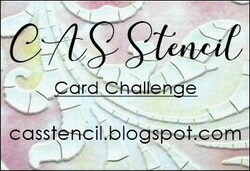 Thank you so much for hosting this fun challenge and sharing your great photo tutorial, Julia! 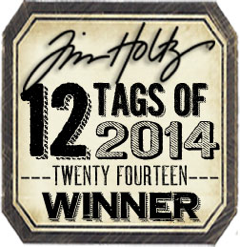 I love your cool rubber band stamped images and the three ink colors you used! The matching mattes are a nice touch too. Happy Easter to you and your family! This technique has been on my 'to try list' for an age - so Thank You Julia for choosing it for this month's Challenge. I will soon be able to tick this off my list. 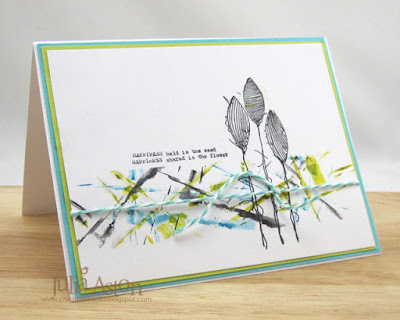 Love how you created your rubber banded card especially adding 2 different colours for great interest. Those flowers are just perfect with that lovely sentiment. Nice finish with the twine. Julia, this is such a fun technique and I love how I never know what it's going to look like! It's a wonderful surprise each time! Love your colors here and the artsy flowers! 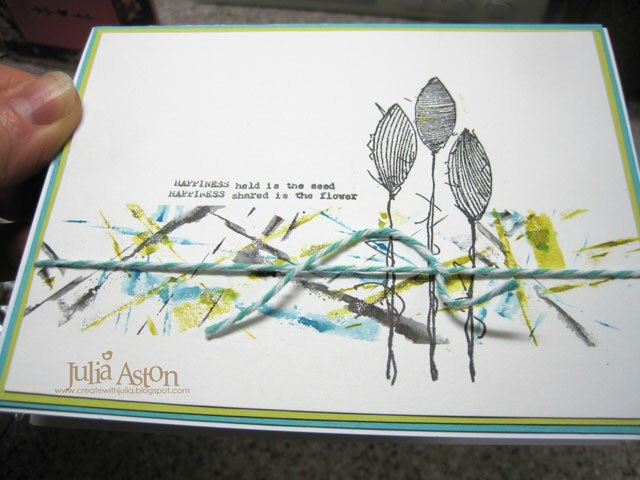 A fantastic card and a fun challenge, Julia! 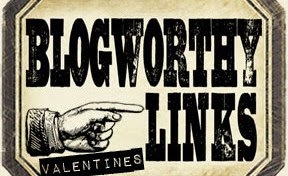 Thanks for hosting this month. Love your artsy cross-hatched backgrounds. Great idea to try spritzing the rubber bands with water! Love those simple flowers and the lime and turquoise borders! Now off to find some rubber bands! This is a great technique and makes for a very effective clean and simple card! Those colors are some of my favorites, too. You are inspiring me to try clean and simple! Hugs! Your colour choices worked beautifully and the stamps you chose to feature work perfectly with the background strip.